You are no match for the mighty Thor! You’re really taking your life into your hands when you’re a bad guy in the Marvel universe. If you rob a bank, you never know who’s going to come after you: a man imbued with radioactive spider powers, a skull-clad vengeance-driven former marine strapped head to toe with lethal weapons, a gruff, functionally immortal Canadian with indestructible claws coming out of his fists -- none of these are good sights when you’re on the wrong side of the law. But if you’re really down on your luck, and we mean just genuinely unfortunate, you’ll have the literal Norse god of thunder swoop down on you with a serious beef and a magic hammer in tow. That spells “game over” no matter what language you speak. If you dream of defending Asgard and all the mortal realms, then you have to have a few things. Wrist guards are just one of them, but they’re absolutely indispensable nonetheless. 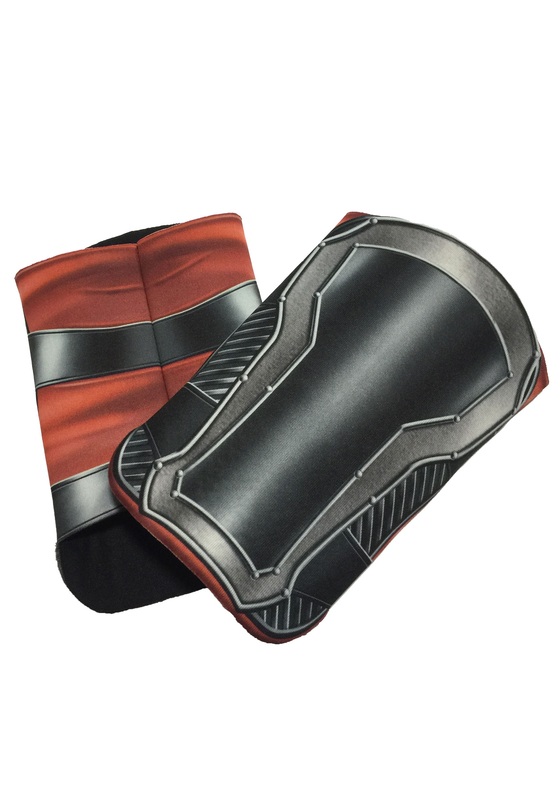 When you wear the Child Thor Avengers 2 Wrist Guards, no robot will be able to destroy the planet, even if he sounds just like James Spader!